Last week I taught at Bradford District High School, the same high school I went to as a teenager. Family, teachers and perfect strangers were quite intrigued and curious about what this experience was like for me. It seems most people can imagine, for better or for worse, what this would be like them. It was a great week. I am grateful. I could make a long list of all the things that inspired me about this experience. The short list includes: the equity work being done at the school by a few committed teachers, the fact that Bradford now has a GSA, and meeting Karen Stewart and many brilliant students. Much love to Joanne Bridgeman-Sparks for guiding the library-ship and to Judy Faria for organizing this! The Ontario Arts Council’s Artist in Education funding made this week of workshops possible – a week where students created their own spoken word pieces, after learning about the art form, and performed them too! 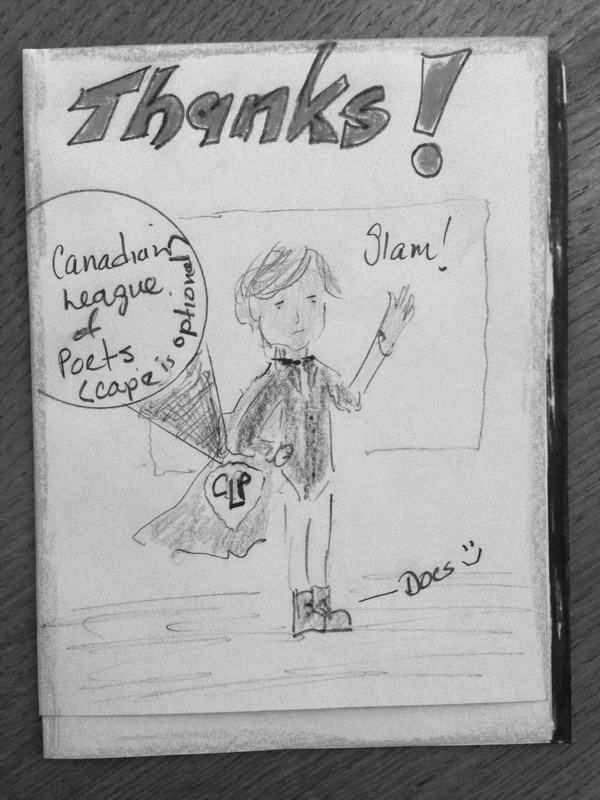 In a Writer’s Guild meeting (a club that meets at lunch to write and talk about writing) we discussed what it’s like to earn a living as an artist and my work with the League of Canadian Poets came up. Stewart’s first vision was of me in a cape…. and that is what you see in this fabulously hand-made thank you card pictured here! This entry was posted in Workshop news and tagged high school, ontario arts council, workshops. Bookmark the permalink.